The number of women who became priests in the Church of England outnumbered men last year for the first time since the church began ordaining women. The Church of England said 244 women were ordained, compared with 234 men. Most of the women becoming priests in 2006 did not become full-time paid clergy, but took voluntary posts. 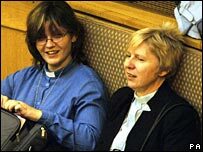 A spokeswoman for the Church of England said issues of inequality between men and women, who first became priests in 1994, were being addressed. BBC religious affairs correspondent Robert Piggott said the number of people training for ordination rose in the last decade, with women making up a steadily larger proportion. Recent research showed that half of priests ordained in recent years were women and concluded that without them pulpits would become "depopulated". Women now make up a quarter of Anglican clergy. Just half of new priests have full-time salaried positions, with the rest taking the increasing number of unpaid posts - often in parishes where the Church cannot afford to pay a salary. Of those ordained last year to full-time stipendiary or paid ministry, 128 were men and 95 were women. About 60% of the women were trained to do these voluntary duties. Some claim that the relatively small number of women promoted to senior positions, such as cathedral deans and archdeacons, shows that they still face discrimination. Last year, University of Manchester researchers said that, despite their increasing numbers, women clergy seemed not to have made an impact on the Church because it was "far from being an equal opportunity employer". It cited 2005 figures which showed that most men who became priests went into paid "stipendiary" ministry, while most of the women were in voluntary posts. But the Reverend Rosemary Lain-Priestley, secretary to the National Association of Diocesan Advisers in Women's Ministry, said many bishops wanted to appoint more women to senior roles, but there were issues that "undermined this process". A lack of mentoring and preparation meant women were reluctant to put themselves forward, and a Church emphasis on "experience over aptitude" also ruled some women out. She added: "Many women priests feel that until women can become bishops they will not be taken seriously in other senior roles, despite the success of women deans and archdeacons. "These issues are being addressed, but cultural shifts do not happen overnight." Senior members of the Church are now considering the introduction of women bishops. More than two-thirds of the General Synod have backed the concept as "theologically justified". In a separate set of statistics, the Church confirmed provisional figures from January showing average Sunday attendances fell below a million for the first time in 2005 to 988,000. Average weekly attendance in that year was 1.17 million, and average monthly attendance was 1.7 million. Attendance at Church of England services on Christmas Eve and Christmas Day increased dramatically in 2005 - it was 7% higher than in 2001 at 2.8 million. A misunderstanding on women priests?